Aino is a family-owned company founded in 1990 by Liisa Kotilainen and Vesa Poutiainen. The two Finns had worked in the fashion industry for most of their lives, and after they met on the job, they combined their expertise to begin producing their own fashion line. Turns out Liisa’s vibrant colours and detailed craftsmanship were a perfect match for Vesa’s verve and business acumen. The result has been any number of dazzling Aino collections that feature clothes with personality for satisfied customers the world over. Aino’s values haven’t changed over the years, and so it’s no wonder that many of Aino’s retailers are also family-owned companies. We insist that our clothes are made by high-quality European firms. We are proud to promote sustainable development and make ecological clothes that are built to last – in line with the age-old Nordic design tradition. Aino designs may be Nordic, but they are also Finnish. This means that each design has an underlying theme of everyday practicality running through it. Here in Finland, it is often dark and drab for months on end during our colourless winter. This is why Aino’s signature look features bright and cheery colours and intriguing details. To sum it up: Aino is a European clothing maker brand that seeks to bring fun and happiness into people’s lives! Stylish clothes from Aino bring beauty and added value to women’s everyday lives. The design, drape and colour of our designs are intended to strengthen our customers’ unique personalities. The Finnish name of Aino can be traced back to our country’s ancient folklore tale, the Kalevala. The Aino of this national epic is an inspiration for all of our work, as she is an independent and self-confident young woman who turns heads with her beauty. It remains a common name in Finland to this day, and it has great personal meaning for Aino’s chief designer Liisa, as it is the name given to both her mother and her daughter. At Aino, every woman is beautiful, unique and valued. Aino is a Finnish company that calls Helsinki its home, but it is also proudly identifies itself as Nordic and European. Each of our garments is designed in Finland and manufactured by a select group of highly accountable European partners. Our exacting standards have earned us the right to use the prestigious Design from Finland label. 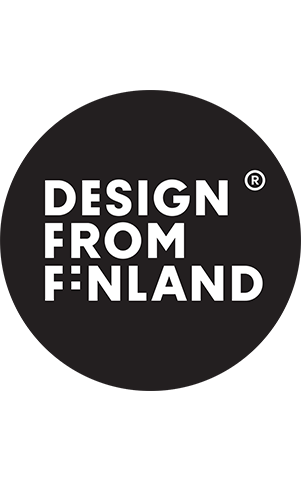 The Design from Finland label communicates to our customers that our products are Finnish in origin. It is also signifies our deep commitment to locally sourced high-quality design and production – a cornerstone of our business ethic. For companies working in the garment industry, one of the most important things we can do in terms of environmental sustainability is to make sure that our clothes will both stand up to wear and tear and continue to look good for a long time. This is why Aino invests in top-quality fabrics and strong finishing work. We make clothes to last a lifetime. W H Y D O E S A I N O H A V E T W O D O T S O N T H E L E T T E R i ? We chose the name Aino to represent our company because it conveyed our beloved Finnish roots. After our customers in Japan told us that one interpretation of Aino in their language meant ‘meadow of love’, we were even more inspired to use this word with a wonderful double meaning – and explore the meaning and pronunciation of Aino in other languages, too. While most European countries pronounce Aino in the same way – EYE-know – the French pronounced it differently at first. For this reason, we added the umlaut to the “i”, and voilà, our name is now pronounced the Finnish way in France, too. Finnish graphic artist Jorma Hinkka created a beautiful look for our logo in the 1990s – a stylish and memorable symmetry of dots, inner lines, and outer circle letters. We may talk about Aino in our everyday communications in Finnish, but our lovely logo with the umlaut is our preferred global symbol. For over twenty years now, Aino has been creating countless beautiful collections of women’s clothing, winning thousands of satisfied customers around the world.During this time, we have grown from a small Nordic fashion house into a world-class brand. Aino clothes are now sold in over 20 countries, and demand is growing. We here at Aino are very happy and proud of our accomplishments in bringing Finnish design to Europe – in addition to the expanding markets of the US and Asia.